It’s a new year with endless possibles. Take time to dream big and set audacious goals. Last year might not have been a pretty picture there was more pain than you would like to admit and disappointment. Let yourself grieve, let yourself feel the negative emotions than shake it off put them aside. Do not let them hold you back. In fact, nothing should hold you back from dreaming or from setting goals. Life won’t go according to your ideal plan but that doesn’t mean you stop dreaming! Your struggles will ultimately be used for good, sweet friend. Some how some way, down the road your struggle will be used for good. You will be an inspiration for countless people. You were created for an extraordinary life. A life overflowing with joy, laughter, and love, even in the midst of chaos. It is tempting when living with a chronic illness to make the goal to just survive. But friend, you were created for so much more! 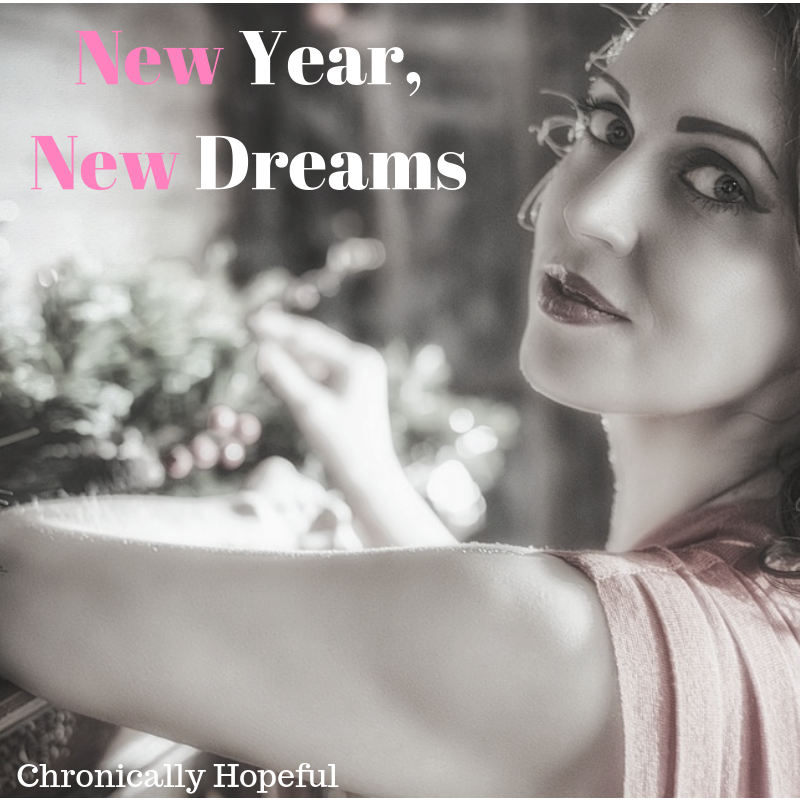 I understand the not wanting to have a resolution because it seems dreams only get crushed. It is essential to have goals. To keep getting up when you fall creating new ways to try again. I have listened to many podcast and Facebook lives by Rachel Hollis lately and I want to share the tips I am using from her. She recommended dreaming your best life five years and ten years from now. Chronic illness version three and five years. I honestly just did the five year and it was extremely difficult but once I let go of my what ifs that surround my health I had fun with the activity. Details are key here. Every aspect of life is thought of from health to what you are wearing during a typical day. Additionally, she talks about the start today journal activity which is something else I use. Write out ten dreams every day as if they have already happened. Instead of saying I want 200 Instagram followers write I have 200 Instagram followers. There is no right or wrong way to do this. If you struggle start small with 3-5 dreams. After this activity she recommends writing out five things you are thankful for. Both should happen as an introduction to your day to help your mindset. I think actives like these are vital, even though some may view them as silly. I think that things like these are tools to battle depression and anxiety (of course it is not a cure). Doing these things have helped me to be more motivated and hopeful. Furthermore, I agree that starting my day this way gets my mind in a positive space before my day begins. Moreover, in my start today journal I wrote out two Bible verse and two quotes for the month. I wrote out four things I want to be, specifically, this month I am hopeful, joyful, hardworking, and brave. I recorded Abby’s goals for January. Next, I wrote my top three focuses for the month. Lastly, I write a to-do list for about two weeks of everything I want to get done. If you want to hear more about how I stay organized please check out my YouTube channel. I will be posting a video about organization in the new year this week so be sure and subscribe so you don’t miss it! I want to leave you with a motivational video. Let me know in the comments if you have any goals or resolutions or dreams you are working towards in 2019.